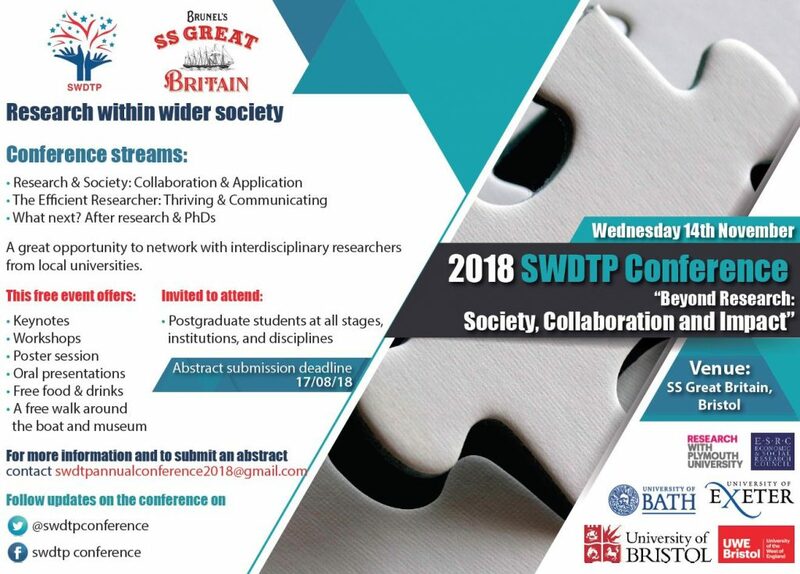 This year’s SWDTP Annual Student Conference 2018 was a success! 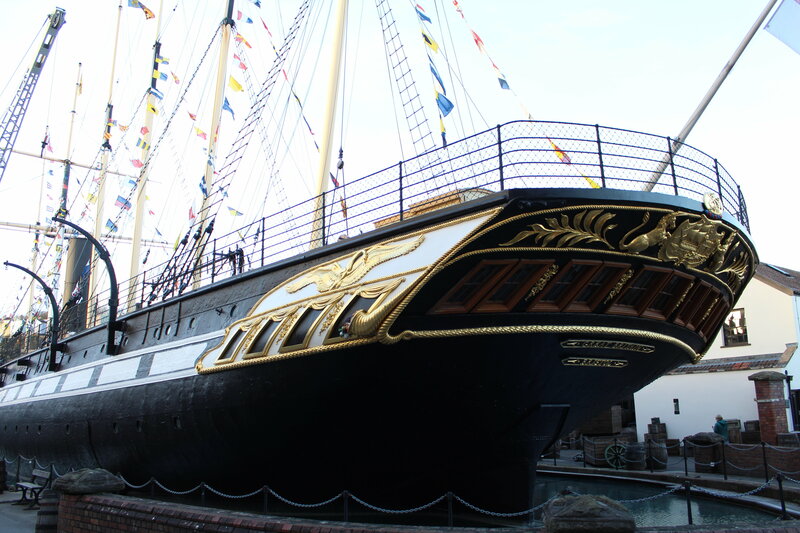 “Beyond Research: Society, Collaboration and Impact” took place at the SS Great Britain Museum in Bristol. More than 140 delegates attended the event and had an opportunity to visit the museum ship. The welcome and introduction speech to the conference was given by Anastasiia Kovalenko, Organising Committee Chair, and Professor Sally Barnes, Director of the South West DTP; followed by the keynote speakers Nicole Ilott, Kaydee Owen, talking about the collaboration behind a literacy and numeracy project. The first parallel workshop sessions consisted of three streams. “Research and Researcher” involved inspiring talks from Leanne Cameron on data collection, Carl Bescoby on positioning oneself as a researcher in communities, and Tanyapon Phongphio on pedagogical techniques to faster critical thinking. Kelly Preece gave her motivational talk on post-PhD, and Abi Dymond explained how to make impact beyond academia as part of the “What Next?” stream. During the “Community Collaboration” stream the delegates attended the talks by Sam Whewall on how to make the most of your PhD, Diana Erandi Barrera Moreno on intergenerational relationships and Christopher Moreno-Stokoe on collaboration within NHS. "Such a diverse range of timely political topics at #SWDTPConf18 - child grooming, Facebook scandals, latte levy, problematic tasers..feeling lucky to be a part of this debate today!" 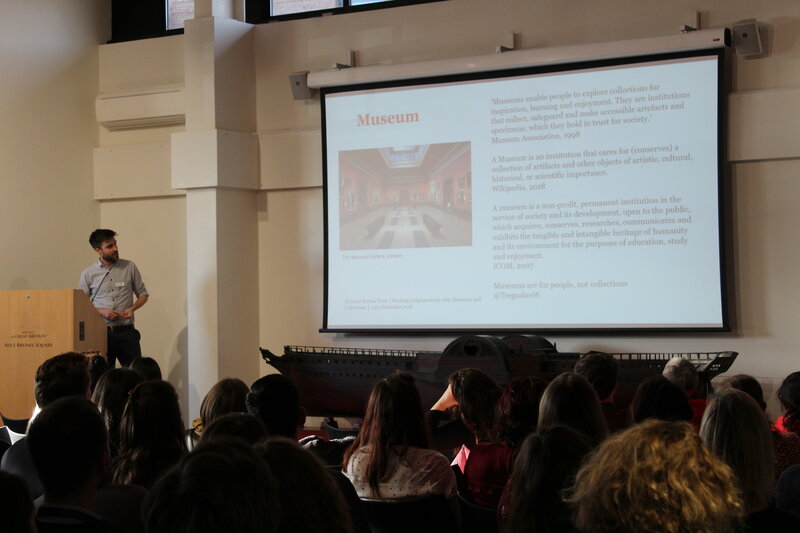 Nick Booth, the keynote speaker, gave an overview of the SS Great Britain Museum collections, collaboration opportunities and research. The presentation was followed by the three parallel workshop streams: “Collaboration for Impact”, where Maike Klein gave the presentation on the use of a steering group in addiction research, Clare Denholm was talking about a road less travelled, and Beatriz Gallo Cordoba was talking about a wellbeing internship at the Welsh Government; “The Personal and the PhD” with the presentations by Claire Lee on collaboration in research with service children, and Louise Toller on being efficient in PhD and M.E. 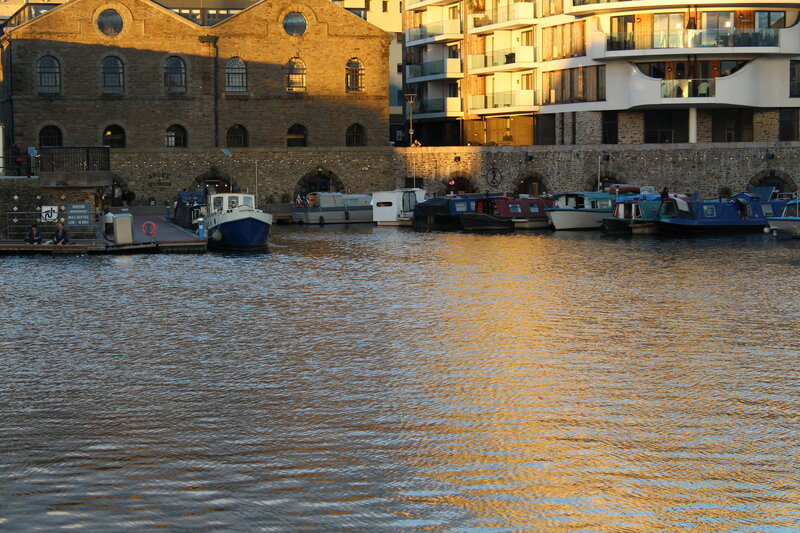 as a chronically ill researcher; and the third workshop stream was “Collaborating for Change” with the motivating presentations by Ola Aleksandra Michalec on building institutional capacities for transdisciplinary PhD programmes, Peter King on environmental policy requirements, and Joy Cranham on an alternative approach to educating families on safeguarding. The final keynote speaker, Dawn Mannay, in her speech expanded more on the Potential of Visual and Creative Techniques for Engaging Diverse Audiences and Increasing Research Impact. In the final three streams “Challenges of Collaboration”, “The Ethics of Technology“, and “Quantitative Methodology”, the speakers shared their research and experience in co-creating an intervention with older people - Debbie Kinsey, collaborative teacher research – Aminath Shiyama, researching the use of Facebook by UK political parties - Tristan Hotham, on democratic design of technology in Brunel’s City - Kit Fotheringham, R software - William Nicholson, and data analysis of income disparities at household level- Tanveer Naveed. The day ended with the poster prize giveaway, a closing speech by Professor Sally Barnes and Anastasiia Kovalenko, and an evening drinks reception. 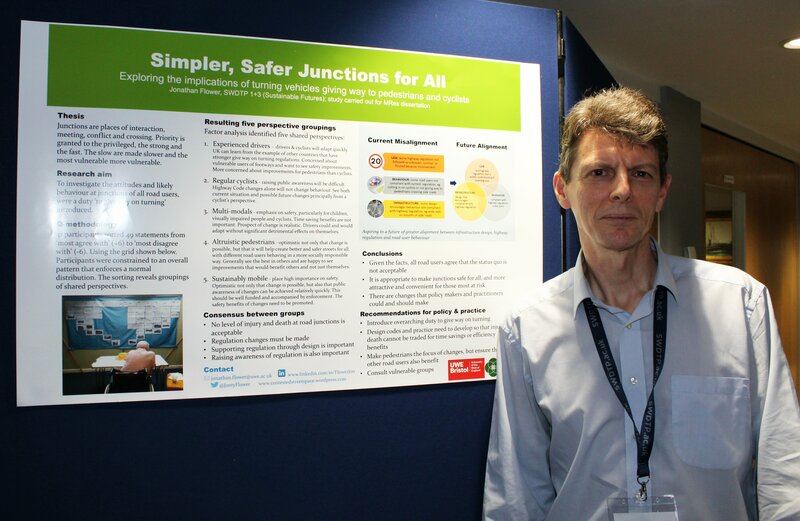 Jonathan Flower (Sustainable Futures, UWE)! The Committee members Anastasiia Kovalenko University of Exeter, Abigail Marchant, University of Bath, Adriana Suarez-Delucchi, University of Bristol, Dan Zhao, University of Bath, Debbie Kinsey, University of Exeter, Eliana Maria Osorio Saez, University of Bath, Gabriela Argumedo Garcia, University of Bath, Martin Preston, University of Bristol, thank everyone for participating and attending the Conference and we hope that you enjoyed it! This has been such a valuable experience for the team. You can download the 2018 Conference Booklet if you want to know more about the day's proceedings! Please don’t forget to contact the SWDTP team if you wanted to be on the Organising Committee next year.